There’s nothing better on a cold chilly night than a bowl of warm soup. 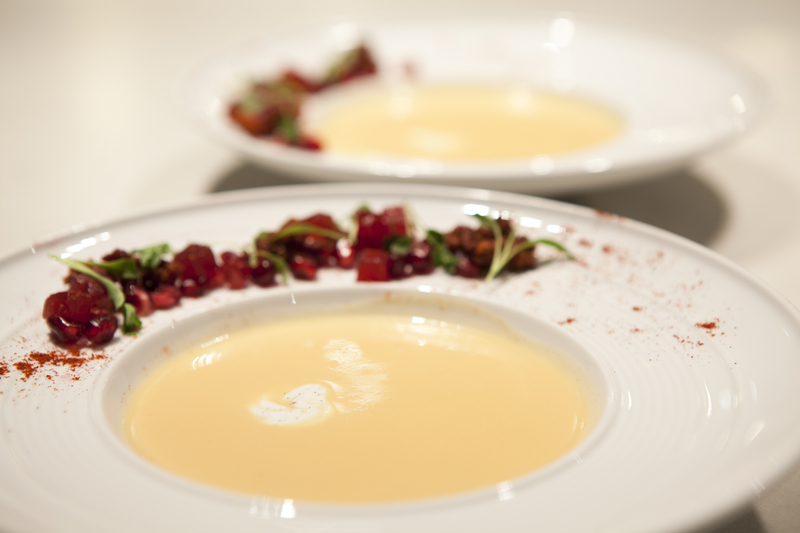 This Acorn Squash Soup recipe was created by Bravo’s Top Chef, Richard Blais. By using Dannon Oikos Greek yogurt Blais makes the soup a little healthier, but still delicious! 1) In a stockpot, cook the onion, bay leaf, garlic and celery in some olive oil until garlic releases aroma. 2) Add the chopped acorn squash and then the chicken stock and simmer. When the acorn squash is cooked, swirl in Dannon Oikos plain Greek nonfat yogurt and remove from the heat. 3) In a separate pan, cook the chorizo and paprika. 4) When the squash is cooked thoroughly, puree the soup and pass through a sieve so it is smooth. 5) Garnish with the crumbled chorizo, the cilantro, pomegranate seeds, a squirt of lime and top with a dollop of yogurt. The cranberry jelly is a great touch! Sounds SO good! I love acorn squash. Had an amazing butternut squash soup at Sable Kitchen not long ago. Yum! When does the cranberry jelly get added? I’ve never had this kind of soup, but looking at it, I think I have to try it now.